The marble slab, with cupid-bow front and hollowed sides, is trellised with a medallioned-mosaic and vari-coloured patchwork as brilliant as John Rich's harlequinade costume of the mid-l8th Century pantomine. A pair of related Florentine marble tops, with medallion vignettes set in trellised mosaics, are displayed at Saltram, Devon and are likely to have been acquired during the 1764 Grand Tour of John Parker, 1st Lord Boringdon (d. 1788)(see C. Johnson, Saltram, London, 1998, pp. 9 and 11). Patterns for 'Marble Tables' in this French 'Picturesque' manner, with flowered festooned Roman acanthus and scalloped cartouches, feature in the carver Matthias Lock's publication Six Tables, 1746. 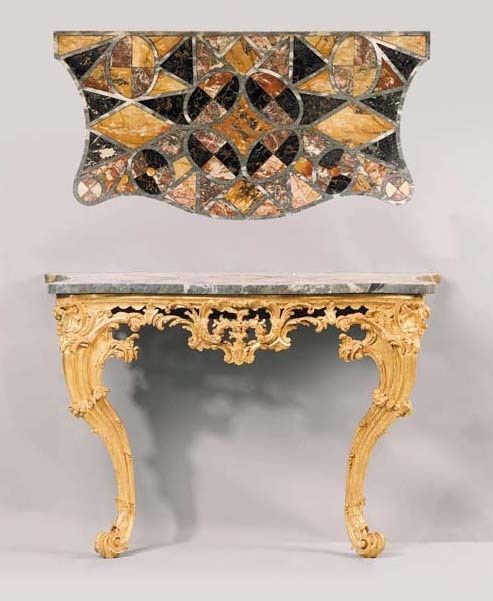 A related console table was sold anonymously, Christie's New York, 24 April 1993, lot 67.